Maine marijuana advocates expect Gov. Paul LePage to veto a recreational cannabis bill that’s laden with business opportunities. But even if the bill’s proponents can muster enough support to override a veto, legalization advocates worry the Republican governor could find other ways to delay or undermine implementation. “There’s a chance he could drag his feet for all of next year,” said David Boyer, the Marijuana Policy Project’s political director for Maine. Lawmakers passed the legislation Monday night after the Marijuana Legalization Implementation Committee spent eight months rewriting a voter-approved measure. LePage has until Nov. 3 to sign the legislation, veto it or allow the measure to become law without his signature. The governor has threatened to veto any bill that doesn’t delay the implementation of recreational marijuana until 2019, and observers expect such action. In the event of a veto, legalization forces are hopeful they can persuade a relatively small number of representatives who voted against the legislation to support an override vote and give adult-use entrepreneurs a fertile landscape in which to work. If lawmakers can’t override a LePage veto, then the original legalization initiative passed by voters would become the statute on the books. While not as comprehensive as the new bill, it still provides a road map for regulators. But because of the potential delays and the rulemaking that lies ahead, the rollout of Maine’s recreational marijuana program, originally expected in January 2018, may get pushed back until late next year or even early 2019, advocates say. “It will affect the rollout,” predicted Christopher McCabe, a Portland, Maine, attorney who specializes in cannabis issues. While not perfect, the new marijuana law has a lot for marijuana businesses to like. And, in many ways, it’s better than the initiative passed by voters last November, advocates said. For example, lawmakers removed from the legislation a statewide cap of 800,000 square feet on canopy space – in other words, if there are 10 growers in the state, they can have more than 800,000 square feet of canopy space among them. Removing the cap would allow for more competition and opportunity, McCabe said. “This really opens the market to small businesses,” he added. The legislation also offers a grow license system with multiple tiers in which the lowest tier – Tier 1 – allows cultivators to grow as few as 30 plants. “It gives the small growers that already exist in the state a legal pathway to adult use,” Boyer said, adding that such a tiered system encourages small growers to participate in the industry rather than ply their craft in the black market. Under the legislation, the largest grow license – Tier 4 – allows for up to 30,000 square feet of canopy space, although increases can be requested. Cultivation license fees will also depend on the tier, and fees for indoor grows will be double those for outdoor grows. A Tier 1 license will cost a few hundred dollars based on the number of plants a grower has, while a Tier 4 license will cost $15,000 for an outdoor grow and $30,000 for an indoor grow. Adult-use retailers will be able to own up to four stores in the program’s first few years, Boyer said. The bill will not change Maine’s medical marijuana program, so dispensaries could operate as is. But the legislation eliminates the licensing preference the voter-approved initiative had given to MMJ businesses, which would have been allowed to apply for rec licenses earlier than new entrants and, thus, begin sales sooner. 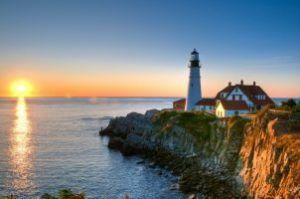 While the bill eliminates preferences for the five existing MMJ licensees in the state – they operate eight dispensaries among them – it also gives locals an advantage with a stipulation that business owners must be Maine residents for at least two years. Co-location for both medical and rec sales will be allowed, although the details on how that will be done must be hashed out in the rulemaking process, Boyer said. The new bill also permits municipalities to prohibit marijuana businesses but allows for cannabis social clubs. For all its positives, the legislation has its shortcomings, Boyer said. The bill postpones the opening of social clubs until 2019, which Boyer believes is a mistake in a state with only 1.3 million residents but which gets 36 million tourists annually. Given the possibility that the governor will undermine the adult-use industry rollout, Boyer wishes the bill offered “some kind of safety valve legislation” to counter any moves by LePage – such as giving localities the option to license businesses if he prevents state agencies from doing it. Boyer noted, however, that lawmakers could add such safeguards when they return to session. If the governor does veto the bill, lawmakers can try to override it – but it won’t be easy. Slightly less than two-thirds of lawmakers supported the bill in Monday’s vote. But the margins are close enough – the bill won 81-50 in the state House and 22-9 in the Senate – that supporters will try to persuade some lawmakers to change their votes, Boyer said. Regardless of which guidelines become law – the new legislation or the original voter initiative – the governor could try to undermine or delay implementation of either by dragging out the rulemaking process or withholding the funds needed to implement the program.